Commonly known to predate on insects, praying mantises have occasionally been observed to feed on vertebrates, including small birds, lizards, frogs, newts, mice, snakes and turtles. Mostly, such records have either not been scientifically validated or have occurred under induced and human-manipulated circumstances. 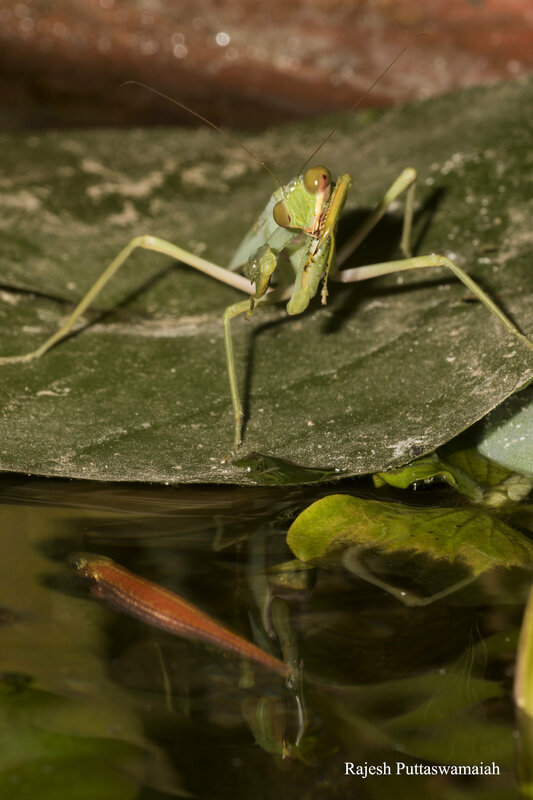 Nevertheless, no scientific data of mantises preying on fish existed until the recent study of Roberto Battiston, Musei del Canal di Brenta, Rajesh Puttaswamaiah, Bat Conservation India Trust, and Nayak Manjunath, published in the open access Journal of Orthoptera Research. Last year, the team observed an adult male hunting and devouring guppies in a pond located in a private roof garden in Karnataka, India. Curiously enough, the predator came back five days in a row and caught a total of nine fish (a minimum of two a day). To reach its prey, the insect would walk on the leaves of water lilies and water cabbage growing on the surface of the pond. Apart from being a curious first-of-its-kind, the observation raises three new discussion points worthy of further study, point out the researchers.